Our focus on great smiles at Orthodontics on Silver Lake (OSL) includes protecting both our lips and our teeth, especially in the summer. 1. Our lips have little to no melanin or pigment, so all of us, whether fair or dark skinned, are susceptible to sun damage on our lips. 2. The sun’s UV rays can result in the formation of wrinkles around our lips which is a sign of premature aging and sun damage. 3. Lip cancer represented 50% of all oral cancers, with 81% of new cancers occurring on the lower lip, according to researchers at the University of Western Australia. 4. Lip cancer is 3 times more common in men than women. 5. ONLY 37% of us use sunscreen or lip-balm, according to a University of Texas Medical Branch survey of beach-goers. 6. Dr. Steckel’s plastic surgery colleagues recommend a UV lip balm with an SPF of 31 or greater. Think lifeguards, zinc oxide. You can get the same protection now with transparent zinc oxide formulas. 7. Use lip balm on sunny and cloudy days for best protection. A study referenced in Dr. Steckel’s July 2014 OSL blog showed consumption of sugar-sweetened beverages are a stronger risk factor for dental decay than snack foods or poor brushing. That means just maintaining good brushing and flossing are not enough to offset the damaging effects of sugar-sweetened drinks. Why is this? Sugar feeds the bacteria that naturally live in your mouth. These bacteria consume the sugar and produce harmful acids that erode the enamel of your teeth. Your friends at OSL are here to help! 1. Lemonade – Everyone loves lemonade. The sound of ice clinking in a big glass pitcher, the distinctive summer sunshine color, and that sweet and sour taste. BUT – most lemonade is absolutely loaded with sugar and combined with the citric acid from the lemons can spell disaster for your teeth and possibly costing you a fortune in reparative dentistry. INSTEAD enjoy your lemonade by making it yourself and using natural alternative sweeteners Xylitol or coconut sugar, or simply adding less cane sugar to the mix. 2. Milk – It’s not just for cereal! The health benefits are well-known: high in calcium, and what better time to consume this drink than in the summer when you’re in the sun making all that Vitamin D to absorb the calcium! Milk is available in traditional cow-sourced, and also almond, coconut, low fat, non-fat . . . take your pick. 3. Water – Last but not least, the ultimate tooth-health elixir! Water washes away bits of food and acid that accumulate on your mouth, thus reducing the corrosive agents acting on your teeth. Water helps regulate the amount of saliva in your mouth. Saliva contains minerals that counteract tooth-eating acids, making it the number one protector for your teeth. 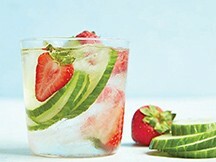 If you want to mix things up a bit, try adding some sliced strawberries, lemons, mint or cucumbers to your water pitcher or bottle. Adults- never had treatment OR had treatment and want to re-create a smile they’ve always wanted. For Everybody-Periodontal status? Oral hygiene status? Clenching/Grinding? Oral habits? Oral piercings? Time commitments? Dr. Steckel and Team OSL believe in helping our patients stay out of sticky situations and keeping their smiles bright! Call us today at 302-672-7776 or go to doverorthodontics.com.